The Plumber is one of the "trade" journals that eventually merged to become the ENR (Engineering News-Record). Stretching a point, trade journals can trace their history to the mercantile letters of 14th century, when the great houses of Europe had far-flung enterprises and needed information on the business methods, politics, and social customs of remote sites. With the advent of newspapers in the early 17th century, followed by the scholarly journal, the trade publication was a logical merger that became popular in the late 19th century. The Plumber was a creature of its era, though. Although its topics are "ventillation of sewers" and the "settling of house drains," many of the articles, unsigned, are obviously written by the editor as essays. 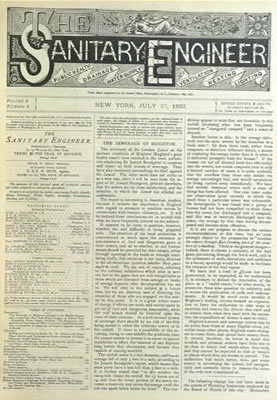 Half of the issues are finely illustrated advertisements; the rest includes letters from readers and copies of reports from other magazines, newspapers, and government or professional organizations.